In 1870 France declared war on Prussia but soon lost the war in 1871. The Prussian victory was the final test of leadership for Prussian King Wilhelm. In the afterglow of victory, he announced the formation of the Second German Empire at the Versailles Palace in occupied France… the new German Empire was born on French soil, a symbolic gesture, a retribution of sorts, because France dissolved the First German Empire in 1806. The Day of the founding of the German Empire, January 18, became a day of celebration, marking when the Prussian King William I was proclaimed German Emperor in Versailles. 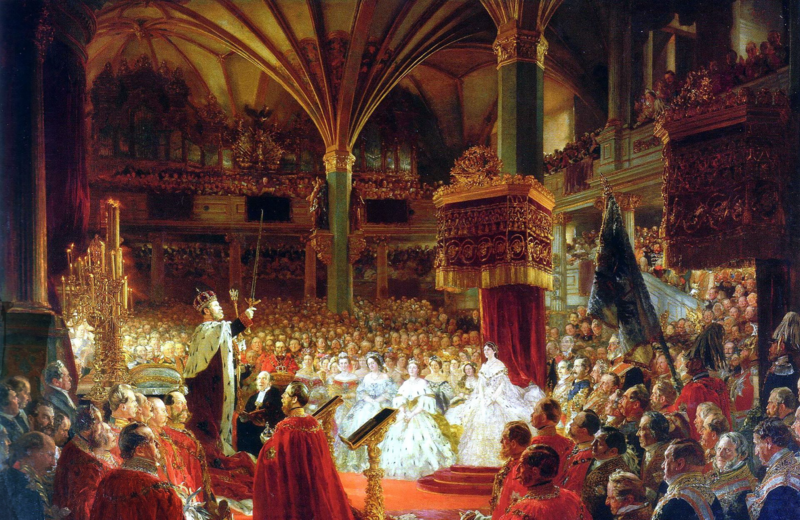 This painting by Anton von Werner… Die Proklamierung des Deutschen Kaiserreiches (The Proclamation of the German Empire) captured the moment when the announcement was made in 1871. This Proclamation painting is the 3rd version, a birthday present for Bismarck, and it still exists at the Bismarck museum in Friedrichsruh. Fortunately there were three versions painted by Werner, because the first version was destroyed in WWII and the second version, done for the Ruhmeshalle in Berlin, was also destroyed in the Second World War. This painting marked Werner’s final breakthrough. He became acquainted with the numerous German princes he portrayed, met with Chancellor Otto von Bismarck and Field Marshal Helmuth von Moltke, as well as with Emperor Wilhelm I. The excerpt below exemplifies the detailed portraits that Anton von Werner depicted in his painting. Among the crowd he portrays General von Blumenthal wearing a red sash, next to Bismarck, shaking hands with white haired General von Hartmann. In the Franco-Prussian War of 1870–71, von Blumenthal was chief of staff of the 3rd army under the Crown Prince. Eighteen other members of his family also fought in this war, including both his sons and three nephews, of whom two were killed. He directed the Siege of Paris but resisted calls to bombard it. Von Blumenthal’s soldierly qualities and talent were most conspicuous in the critical days preceding the battle of Sedan, and his services in the war have been considered almost as valuable and important as those of Moltke himself. The white haired General Freiherr von Hartmann… once aide de camp to the King of Bavaria…led the II. Bavarian Army Corps under command of Prussian Crown Prince Friedrich. When the German armies neared Paris he fought in engagements at Corbeil, Bourg-la-Reine, Petit-Bicètre and Moulin de la Tour. On 19 September 1870 Hartmann defeated General Ducrot in an engagement at Sceaux. Previous postLarge wooden Nail Man statues were set up in cities all over Germany and Austria in WWI.